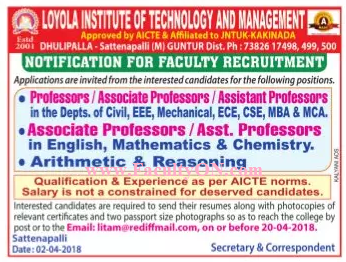 Loyola Institute of Technology and Management, Guntur has advertised in Sakshi for the recruitment of Professor/Associate Professor/Assistant Professor job vacancies. Interested and eligible job aspirants are requested to apply with in 20th April 2018. Check out further more details below. About College: Loyola Institute of Technology and Management (LITAM) was started in the academic year 2001 and has been imparting excellent technical education ever since. With the cream of the engineering talent encompassing both students and faculty coupled with state-of-the-art infrastructure facilities, it is of little wonder that LITAM today stands as one of the stalwarts of engineering education in Andhra Pradesh. LITAM teaches not just the science and technology of engineering, but also instills in each one of its students the virtues and skills needed to make a difference in tomorrow's world. How to Apply: Interested and Eligible candidates may send their resume along with copies of certificates and recent passport size photograph to the following Email/Postal address on or before 20th April 2018.